ASU researcher Manoochehr Shirzaei of the School of Earth and Space Exploration and former graduate student and lead author Megan Miller (now a postdoctoral researcher at the Jet Propulsion Laboratory, California Institute of Technology) used satellite data to map the Houston-Galveston area impacted by Hurricane Harvey to understand why the flooding was so severe and widespread. The results of their study have been recently published in the journal Remote Sensing of Environment. For their study, Miller and Shirzaei mapped the Eastern Texas area of Houston-Galveston impacted by Hurricane Harvey using satellite radar data collected from the European Space Agency's Sentinel-1 A/B satellites and Japan Aerospace Exploration Agency's Advanced Land Observing Satellite. From this data, Miller and Shirzaei then compiled a snapshot of the extent of standing water in the area following the hurricane. They also measured land subsidence (how much the land surface moves downward) for the area before the storm using space-borne Interferometric Synthetic Aperture Radar (InSAR), a radar technique used to generate maps of surface deformation using differences in the phase of the waves returning to the satellite. The technique can measure millimeter-scale changes in deformation over spans of days to years. "Earth-orbiting radar satellites provide us with an opportunity to map areas when other techniques fail due to cloud coverage and lack of ground access to the area of the disaster," says Miller. 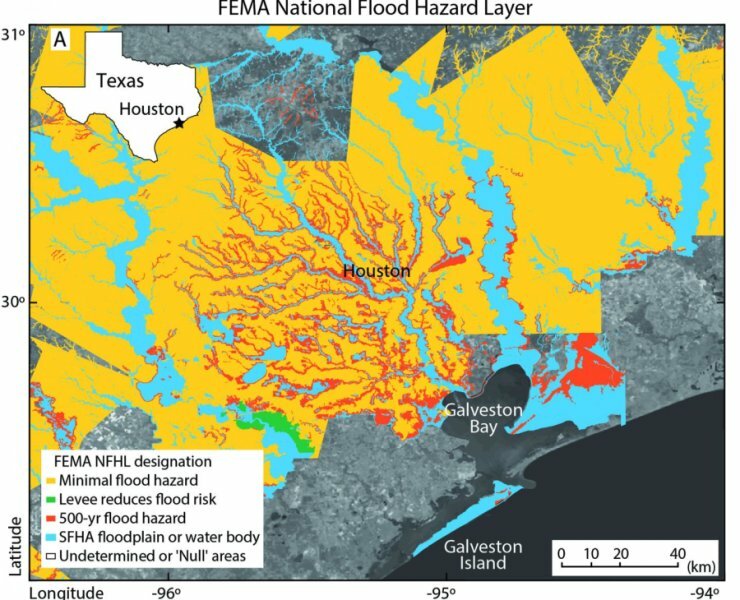 In analyzing the satellite data, Miller and Shirzaei were surprised to see that large flooded areas fell outside the Federal Emergency Management Agency (FEMA) designated 500-year flood zones. "This highlights the need for revising both flood hazard zone maps and flood resilience plans in coastal regions," warns Shirzaei. Through this analysis, they found land subsidence in the Houston-Galveston area of more than 0.19 inches (5 millimeters) per year in 85 percent of the flooded area. The likely causes of subsidence include compaction of sediments, groundwater extraction and hydrocarbon production. They concluded that the area's subsidence affected flood severity by modifying base flood elevations and topographic gradients. "Ongoing land subsidence across the Houston area possibly lowered the flood control structures and changed floodplain boundaries and base flood drainage, which further intensified flooding," says Shirzaei. "In an era of climate change, weather extremes are becoming more frequent and intense," adds Shirzaei. "The combination of extreme rainfall and ground conditions are causing unprecedented flood events not only in coastal areas like Houston-Galveston, but also in Midwestern states where farmers have experienced damage to livestock and agriculture, stretching from Illinois to Louisiana." While risk classification maps used by FEMA provide flood hazard data, this study shows that land elevation and slope are changing rapidly and these maps may need to be updated more frequently to account for such changes.